Murder and merlot! 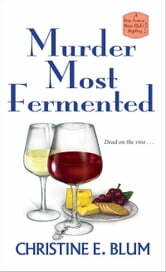 The ladies of the Rose Avenue Wine Club are back to track down another killer . . . When New York transplant Annie “Halsey” Hall starts digging for her tiny SoCal dream vineyard off Rose Avenue, the last thing she expects to unearth is an elderly woman. Between decanting chardonnays and rosés, Halsey and the women of the Wine Club pour over the list of suspects. Could the old woman have bottlenecked her great grandson’s latest scheme? Was it a case of super sour grapes with the local historical society? Or did a devious developer close a killer deal? With the help of the Wine Club and her enthusiastic yellow lab, Bardot, Halsey must untangle the twisted tendrils of the mystery to clear her name and end a murderer’s reign of terroir . . .